Crescendo Admin software allows your organization to easily organize and simplify administration of charitable gift annuities. The software's tracking system produces checks to annuitants, year-end 1099Rs, detailed reports and much more. Interfaces with Crescendo's donor proposal software. Records are easily imported from the software, simplifying data entry. Maintains a comprehensive database of donors, annuitants and gift annuity agreements. Tracks annuity balances based on reserve account earnings. Optional tracking of multiple charities. Easily tracks annuities for one charity or multiple charities. Prints checks and automatically informs user of upcoming payments. Electronic fund transfer capability. If you offer direct deposit for your annuitants, Crescendo Admin will create the ACH transaction file for processing by your bank or credit union. Creates reports for donors, annuitants, payments schedules and more. Creates state present value reports for regulated states as required by state law. Prints 1099-R/1096 tax forms required by IRS and creates the file for e-filing 1099-Rs. GiftMail capability. Sends a custom letter to your existing gift annuitants or imports a list of potential donors through a CSV file, and allows you to send personalized letters marketing the benefits of a gift annuity. Four security access levels. Assigns each user a login and password for authorized access. No-cost conversions from other gift annuity administration software. 1. What are the key features of Crescendo Admin? Crescendo Admin maintains a comprehensive database on all donors, annuitants and gift annuity contracts (immediate, deferred, flexible and term of years annuities), prints checks and/or issues EFT payments to the annuitants, automatically informs user of upcoming payments, prints 1099-R tax forms required by the IRS, computes FASB 116/117 liabilities for annual valuation, calculates reserve requirements for regulated states, tracks annuity balances based on reserve account earnings, includes many reports with customizable search criteria, interfaces with CresPro and CresLite records which are easily imported to simplify data entry, plus offers tracking of multiple charities. 2. Does the software perform electronic fund transfers? Crescendo Admin allows you to enter bank information for your charity and your annuitants, then select to use direct deposit for any person. You may list two bank accounts for each person and split the annuity payments between the two accounts. Based on the information entered, the software will create the ACH transaction file which can be emailed or uploaded to your bank or credit union for processing. 3. Does Crescendo Admin produce state reports? It has the capability of producing the state reports for annual reporting to the states in which you are registered. These reports show the present value of each gift annuity according to the state law guidelines and specifications. 4. 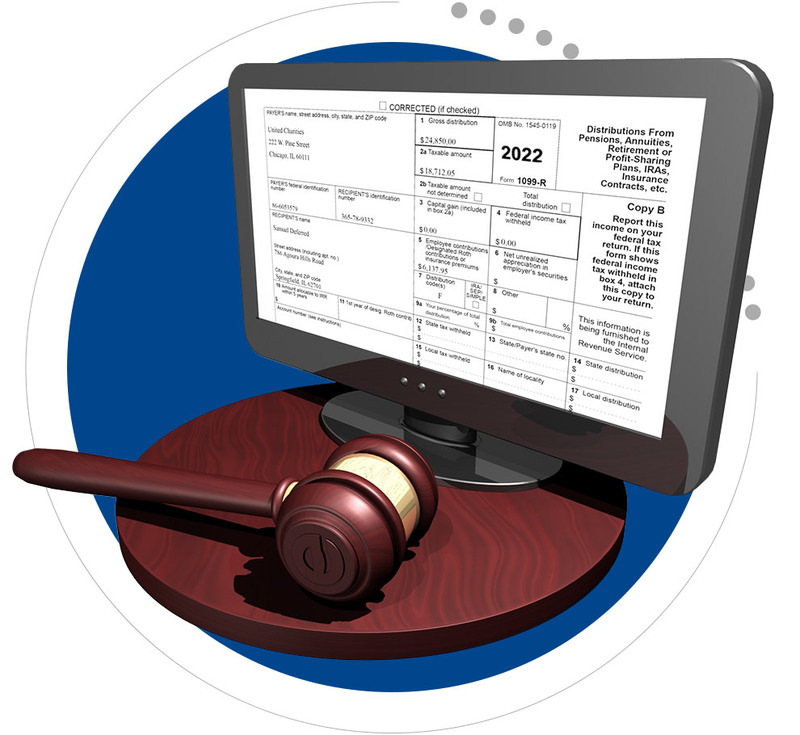 Does the software produce the 1099-R forms that I send to my annuitants and the IRS? Yes, Crescendo Admin will print the 1099-R paper forms for your annuitants and for the IRS. It can also create the 1099-R tax file for electronic (or magnetic) filing of your tax forms. The software allows you to create an individual 1099-R at any time during the year or print all 1099-R forms at the end of the year. If you file paper forms with the IRS, you must purchase a set of pre-printed 1099-R forms - Copy A from your supplier. All other copies can be created by the software directly by printing on blank paper. 5. Does Crescendo Admin have the ability to track the individual gift annuity market values? Admin can help you track the value of each annuity invested in your annuity reserve fund. Being able to determine the market value (or annuity balance) of each annuity on any given date is important for two major reasons. First, it helps you evaluate the success of your program and establish policies on age minimums, rate selection, investment strategies, etc. Second, it helps you calculate the end-of-contract remainder value to charity and decide how much is appropriate to withdraw from the pooled reserve fund at contract maturity. 6. How does the software calculate the ever changing annuity balances? It offers two calculation methods based on the type of monthly (or quarterly) statements you might receive from your investment managers. If your statement shows the monthly or quarterly average earnings rate for your reserve fund, then the software will apply this percent earnings rate to each annuity in the fund. The software takes into account the contribution date for each contract and the distributions (payments) made from each contract. If your monthly statements show the end of month total account balance, then the software will compute the average daily balance for the fund and allocate the appropriate portion of the total balance to each annuity in the fund. Again, the calculation takes into account the new contributions and distributions made from the fund for each month. 7. Does Crescendo Admin interface with any other software? It is a stand-alone product with a comprehensive selection of features needed by any gift annuity administrator. The software has a built-in interface with Crescendo Pro and CresLite planned giving software for ease of importing gift annuity records. Admin does not interface with any other software directly; however, any information contained within the system can be easily obtained through use of Microsoft Access or Microsoft Query tools. Data may be exported to Excel, Word, text files, etc. 8. How can I learn more about the Admin software? We encourage you to take advantage of our free trial. The software is sent along with a packet of information, including "Getting Started with Crescendo Admin" as well as a step-by-step seminar instruction. For our new customers, Crescendo offers free phone tutorials for any of our products. 9. What are Crescendo Admin requirements? Windows compatible operating systems. Upon installation, the program takes up about 54 MB of hard disk space. The database will grow as more records are added. 10. What is included in the purchase? Software CD, install code and instructions, a detailed electronic user's manual and computer/gift annuity support services. 11. Is demonstration software available? Yes, a free trial of the Crescendo Admin system may be requested online or by calling 1-800-858-9154. 12. What technical support is offered? Crescendo is known across the country for its customer friendly support service. Call our toll free number 800-858-9154 for answers to your computer or legal/tax questions. 13. How often are updates provided? Crescendo Admin is updated semiannually with tax changes and program enhancements. 14. Are conversions from other software to Crescendo Admin available? We are able to do some conversions from other software programs to Crescendo Admin. This depends on the software program you are currently using. Please call us at 1-800-858-9154 for more information. 15. What educational resources are available? We have video tutorials in our CresManager web interface and a user manual that comes with the software. For a free demonstration of Crescendo Admin, please complete our trial request form or call us at 1-800-858-9154.